Sometimes it can be hard to find the words to pray, both in times of celebration and when we are hurting. Maybe we haven’t prayed in so long, we aren’t sure where to begin. As Grace Mazza Urbanski writes in the introduction to Talking to God: Prayers for Catholic Women (Franciscan Media, 2016), “We encounter Jesus, and he encounters us, through prayer.” We can’t hope to have a relationship with God if we don’t pray. 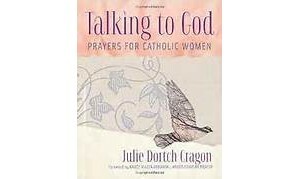 Julie Dortch Cragon understands how busy women are and how easy it is to let prayer fall by the wayside. But, that is why prayer is so important for us. We can’t hope to serve all the people in our lives, to take care of our families, and to be productive in our work, if we don’t root our lives in God. In assembling this collection of inspiring quotes and prayers, she helps make that connection with God a bit easier to pursue. Talking to God offers prayers for almost every occasion, grouped by category. There are prayers to grow in faith and virtue, prayers for bodily needs, prayers for those who long to be parents and prayers for those who are parents (although there seems to have been some minor editorial difficulties in these sections with a couple of the selections in the longing category more appropriate for the parenting section). There are prayers for growing in love and prayers for one’s work. There are also prayers for special family needs and prayers for time of loss and grief. The book ends with a collection of modern Marian prayers as well as time-honored traditional Catholic prayers. One of the most useful pages of the book is “Short Prayers to Keep You Close to God.” Prayer shouldn’t be limited to morning and night. While those times are important and sometimes allow for a deeper connection with God, we need to connect with God throughout the day. These one-liners are easy to memorize and can be used when you need a quick moment of prayer. Talking to God is a lovely book, certain to enrich your relationship with God. It would also be a great gift for the Catholic women in your life.